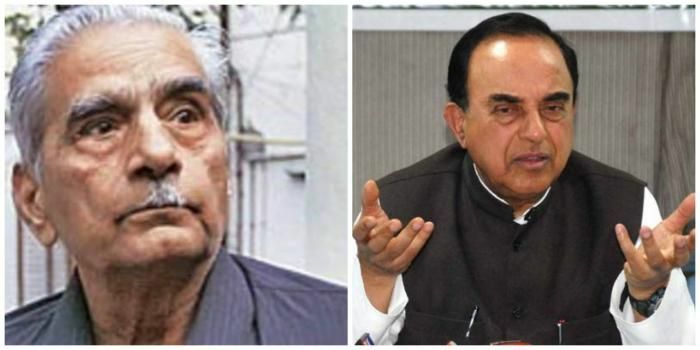 As if Subramanian Swamy\'s dogged pursuit of the National Herald case and the Court\'s summons to the Gandhis weren\'t big enough setbacks, now Shanti Bhushan has waded into the murky controversy. Bhushan claims his father owned a large number of shares in the National Herald. Read on to find out on what grounds he will challenge the Gandhis in the case. The twists and turns in the National Herald case would put a labyrinth to shame. After BJP leader Subramanian Swamy, it is former law minister Shanti Bhushan who has pointed out irregularities in the manner in which the Gandhis acquired the National Herald properties. He has also hinted that he might take legal action and challenge the transfer of control of the Associated Journal Ltd that owned the National Herald to Young India Limited, in which Sonia and Rahul Gandhi own the majority share. Reiterating Swamy's stand, Bhushan said the National Herald was not former Prime Minister Jawaharlal Nehru's property. A large number of patriotic Indians had contributed for a public cause. Their right has been taken away and transferred to a close held company, namely Young India, in which there are only four share holders Sonia Gandhi 38%, Rahul 38%, MotiLal Vora 12% and Oscar Fernandes 12%. My father had bought a large number of AJL shares in 1938, which I inherited. National Herald was started in 1937-38. My father was a Congressman, and therefore, like all well-to-do Congressmen, he had also subscribed to the creation of the National Herald. These facts have to be asserted from the registrar of companies. His name still continues to be on the shareholders list. I am told that assets with Associated journals is worth Rs 2,000 crore. Transfer of control from a large number of patriotic people to the Gandhi family by a sleigh of hand - the issue of 9 crore new shares - is totally illegal. I intend to challenge it in due course. After I have got the names of the heirs of the original share-holder of AJL substituted in place of their father's, I have full intentions of challenging the transactions and the transfer of control of National Herald assets to Young India. I am sure none of the heirs of the original share-holders would want to cash in on the shares. They would want the assets of National Herald to be used for the betterment of the country. At some stage we may call the meeting of all the share-holders. If AJL had problem is paying off their 90 crore debt, why wasn't some assets of the company sold to pay off the debt? National Herald assets are worth Rs 2000 crore. Rs 90 crore was a small loan in that sense. All these decisions about the company must be taken by the original share-holders or heirs not by the handful of new shareholders. The Congress has not let the Parliament function over the National Herald case, calling it a case of "political vendetta". Congress President Sonia Gandhi and Vice President Rahul Gandhi will have to appear before the Patiala House Court on 19 December at 3 pm during the hearing of the case. National Herald newspaper was established by Nehru with the help of many other freedom fighter. It became their mouthpiece against the British rule. Click here to read about the history of National Herald and what exactly are Subramanian Swamy's allegations against the Gandhis.